Beating Wayzata requires more than a hot goalie and a few lucky bounces. No, the formula is much more complex. Let’s just say mapping the human genome is less arduous than harnessing the twin irrepressible forces that are Trojans scoring stars Tony Cameranesi and Mario Lucia. 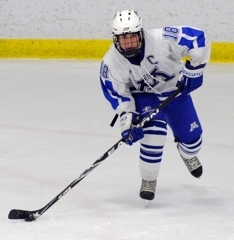 It was an afternoon game, so there’s no telling for sure if the stars were aligned in some sort of oversized M, but Minnetonka certainly had all its Xs and Os in the right places on Saturday, Jan. 29, as it rolled to a stunning 6-0 victory over No. 2 Wayzata in a Lake Conference showdown at the Pagel Activities Center in Minnetonka. In a conference that features four teams ranked among the state’s top seven in Class 2A, a 6-0 running-time thumping when any combination of Wayzata, No. 3 Eden Prairie, and co-No. 6s Edina and Minnetonka square off can only read as a some sort of input error on first glance. Minnetonka goaltender Alex Glockner, for one, will tell you that this final score is legit. Glocker turned aside 29 shots in what was undoubtedly one of the finest performances of his career. Part of that save total included repeated blasts from both Cameranesi and Lucia, who entered the game with a combined 33 goals and 79 points. 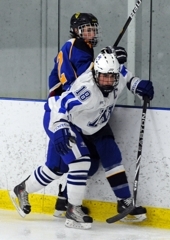 Minnetonka (13-4-1) had been haunted by third period meltdowns earlier in the season, losing leads – and games – with their lackluster finishes. 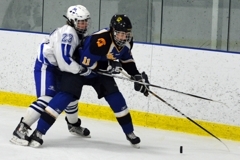 The Skippers started slowly in the third against the Trojans (13-4-2). 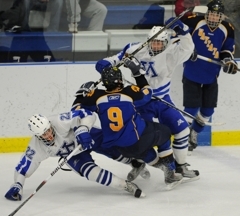 After being trapped in their own zone by a ferocious Wayzata forecheck for the first five minutes or so of the final period, they finally broke out of their zone and broke the game open on a goal by junior defenseman Joe Schuldt. 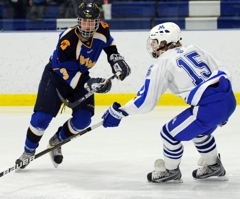 Minnetonka scored four times in all in the third. 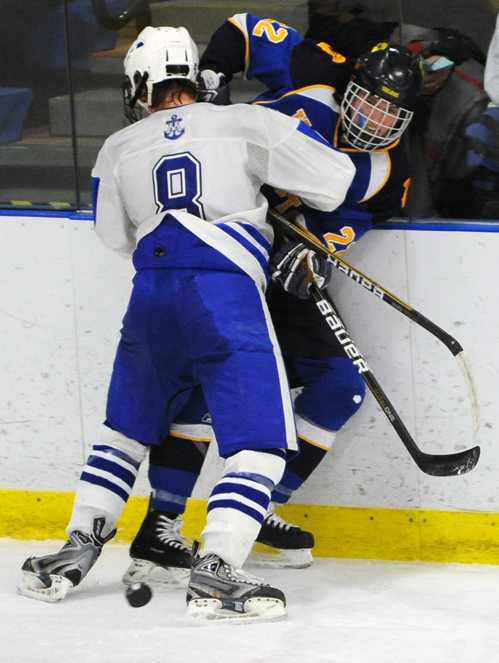 The Skippers’ second goal in the final period, a pretty give-and-go-and-give-and-go-again between Max Coatta and Thomas Schutt, was the backbreaker. 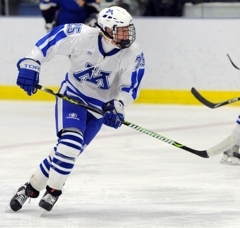 Both Glocker and Erik Baskin, who scored two goals for the third straight game, raved about the defensive performance of Schutt, another of those Minnetonka Xs that was perfectly placed. Sounds easy enough. It takes, however, a player with a certain mindset to relish that defensive role. Well, with time running out in the third and the victory well in hand for the Skippers, Schutt made a sprawling, head first dive and poke check near the blue line that halted a Trojans’ rush. “He wanted to get the shutout I think,” Glockner said. It was that sort of game – all game – for the Skippers. “I thought we played really well in our own end,” Minnetonka coach Brian Urick said. “Five-on-five, we didn’t give up many scoring chances. It seemed like they got most of them on the power play. By the end, the Trojans certainly had the look of a frustrated team. 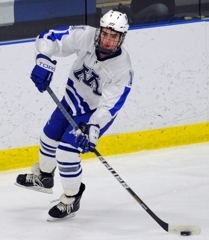 Minnetonka defenseman Jack Teal's goal in the closing minutes completed the scoring and forced the enactment of the state high school league's "mercy rule" -- the clock continues to run even after whistles when a team is leading by six or more. Wayzata coach Carl Davis declined to comment afterward. The Skippers, meanwhile, know they will have to face the Trojans once more in the regular season and, possibly, again in the Section 6AA playoffs. Minnetonka won’t be celebrating this anomaly for long. 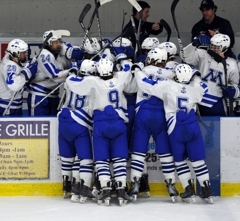 Minnetonka scored four goals in the third period to put an exclamation mark on a stunningly lopsided 6-0 triumph over No. 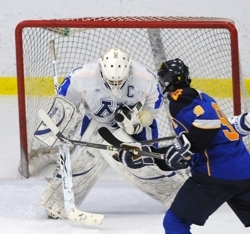 2-ranked Wayzata on Saturday, Jan. 29, at Pagel Activity Center in Minnetonka. The Skippers, tied for No. 6 in the latest state rankings, got two goals from junior Erik Baskin for the third straight game and a brilliant 29-save performance from senior goaltender Alex Glockner. Last season, both meetings between the Lake Conference rivals ended in ties. Baskin opened the scoring in the second period with shot from the high slot that eluded Wayzata goaltender Andrew McIntyre. 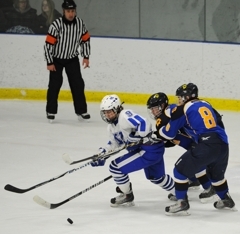 The Skippers led 2-0 just 25 seconds later when junior Phil Katopodis scored. Wayzata (13-4-2) applied heavy pressure early in the third period, peppering Glockner with shots from all angles and distances. 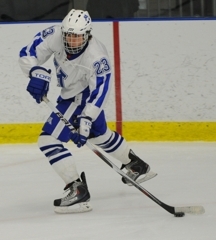 But it was Minnetonka (13-4-1) that proved to be the more opportunistic team, as the Skippers took a 3-0 lead 6:43 into the third on a shot from the sideboards by sophomore defenseman Jimmy Schuldt. Senior center Thomas Schutt put the Skippers ahead 4-0 with the game's prettiest goal. Schutt and linemate Max Coatta passed the puck back-and-forth several times while on a rush, the play ending with Schutt scoring into an empty net. 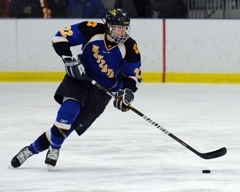 Baskin scored his second goal in the third period, and junior defenseman Jack Teal added a goal in the closing minutes. 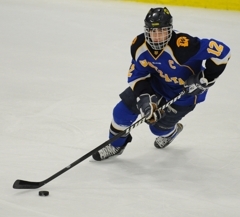 The Skippers killed four Wayzata penalties, and Schutt was particularly effective in shutting down the Trojans’ high-scoring forward duo of Tony Cameranesi and Mario Lucia. 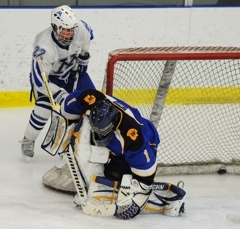 Playing against Wayzata super snipers Tony Cameranesi and Mario Lucia is never an easy task, but the Skippers’ senior goaltender certainly made it appear that way. Glockner was sharp with his angles and stingy with his rebounds en route to making 29 saves and becoming the first goaltender to shut out the Trojans this season. 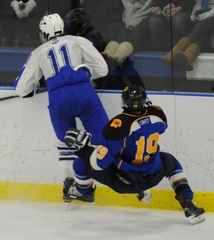 The junior forward opened the scoring in the second period with a signature one-on-one move on a Wayzata defenseman that gave Baskin enough room to unload a hard shot from the high slot. Baskin also scored in the third period and was a forechecking demon all afternoon. He shared the team lead with 12 goals and has scored two goals in each of his last three games (against Edina, Eden Prairie and Wayzata). The senior center known for his stifling defensive play had his fingerprints – and stick marks – all over what was a frustrating afternoon for Wayzata’s top forwards. Late in the game, Schutt was still playing strong defense, as he made a diving play at the blue line to break up a Trojans’ rush and help preserve the shutout. 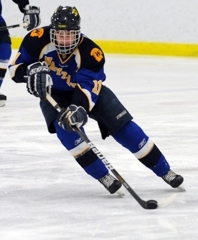 He also scored a gorgeous goal on a highlight-reel passing play with linemate Max Coatta.